This week's giveaway is sponsored by where you will find an assortment of yummy looking food made out of felt. Girl Meets Craft is giving away one food item to one lucky winner and you choose which item you want! I would choose the Milk Chocolate Cupcake with Pink Frosting with Hearts and Sprinkles. Milk Chocolate Cupcake with Pink Frosting with Hearts and Sprinkles. The Pancakes with maple syrup and butter - plush toy is my favorite. Very cute. I absolutely love these crafts! The Vanilla Cupcake with Lavender Frosting and Violet Flower would be perfect in my kitchen alongside the real African violets I grow. Great giveaway! The Pancakes with Maple Syrup and Butter is ADORABLE, I've never seen anything like this! I hope I win, these are so fun and unique! I love the stack of pancakes - and I WOULD use it as a pincushion! I like the lollipop and the tart. I love the Pancakes with maple syrup and butter. So cute. I like the milk chocolate cupcake with pink frosting. the pancakes with maple syrup and butter are sooooooo cute! 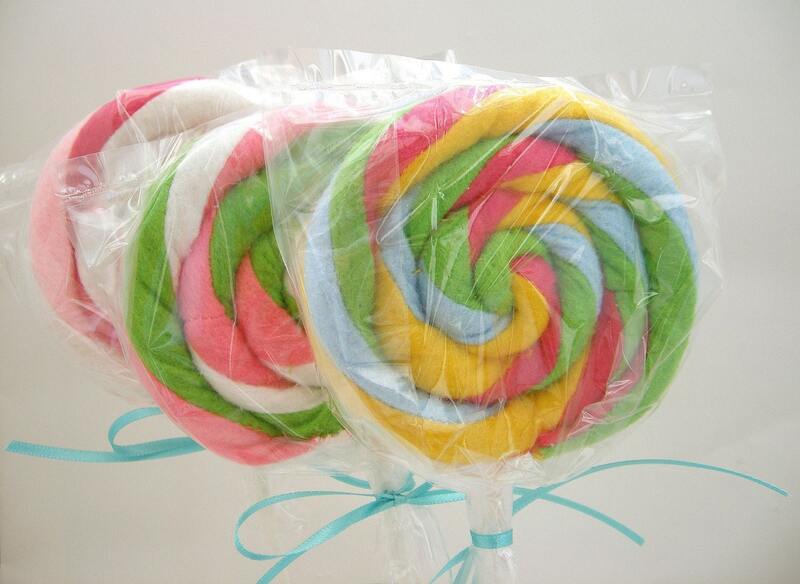 Felt Candy Store Lollipops- Rainbow Swirl Fruit Punch would look great on the wall or in a vase. I love the Vanilla Cupcake with Lavender Frosting and Pansy! 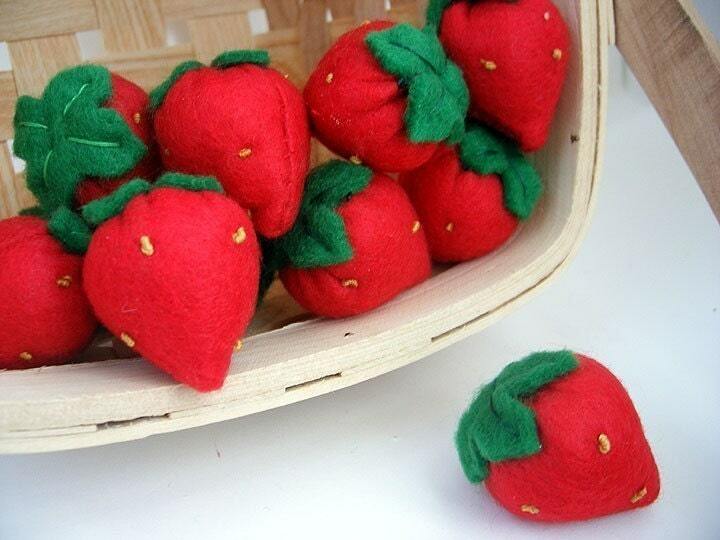 Such sweet felt food!! the pancakes are my fave! What a cute shop! I love the Felt Bakery - Tarte Aux Pomme! The strawberries would be my number one choice. They look fresh and I like fresh berries A LOT. I also think those pankcakes are genious! They look so real I want to eat them! I would pick the Strawberries. I'd even get one with catnip and the kids and cat could share the booty! They're all so cute. I like the strawberries... the cupcake too. My wife loves the Milk Chocolate Cupcake with Pink Frosting with Hearts and Sprinkles. i love the pancakes with maple syrup and butter. my kids love them for breakfast and would get a kick outta getting a toy that looks like the real deal! Thank you for having this. I would love to win. I really like the pancakes with maple syrup and butter. Thank you! Picked Just for You 5 Freshly Sewn Strawberries. Thanks. It's hard to pick a favorite because I love fake food and they all look good! I pick Chocolate Frosted Eclair Donut because I like the way a little bit of filling is leaking out. I love fake food and my youngest definitely loves some fake food! So this would be wonderful! Christina - xristya@rock.com - I like the Vanilla Cupcake With Lavendar Frosting and Violet Flower! Looks beautiful visually and "seems" scrumptious, even though it's felt! My favorite is the Felt Bakery - Milk Chocolate Cupcake with Pink Frosting with Hearts and Sprinkles. I just love the Felt Bakery - Mousse Au Chocolat Mini Tarte! My 10 year old daughter picked the Silk Peony Flower Brooch Pin. She said she would love to make it for grandma for Christmas! Since Red Velvet Cake is my favorite, I would pick the Felt Bakery - Red Velvet Cupcake with Removable Cup. They are all real cute...but...the rainbow fruit punch lollipop is my favorite! I love the Red Velvet Cupcake with Removable Cup - - - very cute! I really like the Milk Chocolate Cupcake with Pink Frosting with Hearts and Sprinkles. Thanks! I adore the Felt Bakery - Vanilla Cupcake with Lavender Frosting and Violet Flower. I love the Pancakes with maple syrup and butter. So cute! 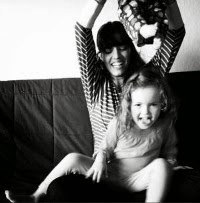 I posted earlier as Jenifer M. (sundayminimalist@yahoo.com) and I wasn't logged into blogger. I just love the Pancakes with maple syrup and butter. I am a subscriber to your post, and love it. I love the hot chocolate recipe. I LOVE LOVE LOVE the Pierre the French Toast. It is so stylish, and cute. I guess, I say I am a follower too? I am new to this idea. I follow you on twitter as well. Well, you are one of my best friends. My favorite is definitely Pierre the French Toast. How cute! Thanks for the chance. My favorite are the Pancakes with maple syrup and butter! I love the Felt Bakery - Dark Chocolate Cupcake with White Frosting and Pink Sprinkles!